Fibergrate's phenolic resin is Coast Guard Level 2 approved flame-resistant resin with a flame spread rating of 5 or less and a smoke index of 45 or less. Shell's Mars exploration and production rig is located 130 miles south of New Orleans in the Gulf of Mexico. Mars is not a solid steel structure, but a floating structure, also called a tension leg platform, and extends below 3,000 feet of water to the Gulf floor and is over 300 feet high above the ocean water. 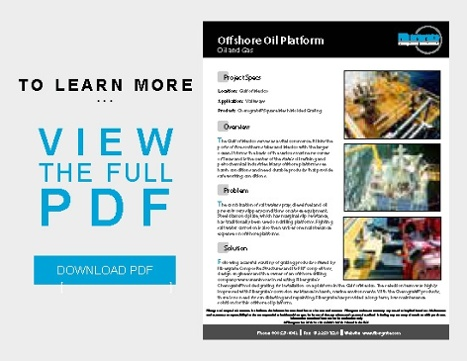 A competitor's FRP phenolic grating was initially installed on the Mars offshore platform. The grating that was installed did not have a UV coating which eventually caused the grating to fade and lose structural properties. Within the past two years, Fibergrate's I6015 phenolic pultruded grating has replaced all initially installed competitor's phenolic grating, amounting to a little over 400 panels. The phenolic resin is Coast Guard Level 2 approved flame-resistant resin with a flame spread rating of 5 or less and a smoke index of 45 or less. Phenolic FRP grating is designed primarily for the offshore industry, providing a safer environment for all offshore workers. In addition to the low smoke toxicity of phenolic grating, it is slip resistant and has corrosion resistant elements that stand up to the harsh salt water environment.